From folk ballads to a world premiere, we explored stories of migration across centuries and continents in our latest Orchestral Theatre production, Songs from the Road. 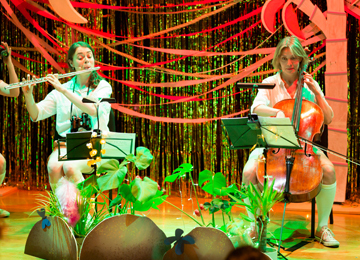 The concert was staged as part of Southbank Centre’s SoundState festival, a celebration of new music from around the world. Very much in the spirit of the festival, we collaborated with a host of global, creative visionaries – American folk artist Sam Amidon, Pakistani singer Ali Sethi, Palestinian video artist Khaled Jarrar, and New York-based composers Du Yun and Nico Muhly to name a few. 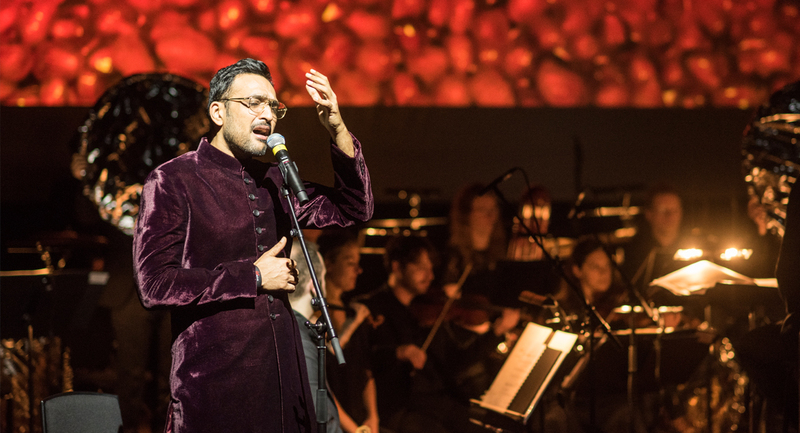 It was a huge privilege and joy to bring together this eclectic mix of artists, songs and soundscapes that spanned the operatic voice to folk music to ragas for our Orchestral Theatre series. Here’s a look back on the big day. Rehearsing in our Orchestral Theatre home the Queen Elizabeth Hall – the view from the sound desk. Pulitzer Prize-winning composer Du Yun joins us for rehearsal ahead of our world premiere of her multimedia piece Where We Lost Our Shadows written with Palestinian video artist Khaled Jarrar. Composer Du Yun and Pakistani singer Ali Sethi, a soloist in the new work, discuss some key musical elements. Our players get ready before curtain time. Opening the concert, we traced the transformation of ‘The Two Sisters’ folk ballad across time and place with specially-commissioned animations by Ola Szmida. Here’s an animation of the 16th-century Norwegian version of the Two Sisters folklore. There are some 531 versions of this ballad spanning folk traditions across the world. Performing a series of versions, we traced the ballad’s journey from 16th-century Norway to modern-day New York City. Here mezzo-soprano Jennifer Johnston sings the English rendition ‘The Miller and the King’s Daughter’. 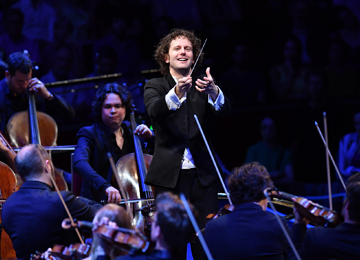 We also paired the folk ballad with Mahler’s arresting Songs of a Wayfarer. Folk musician Sam Amidon concludes the journey with Nico Muhly’s The Only Tune, a brutal modern reimagining of ‘The Two Sisters’ ballad. Nice to have Nico on piano for The Only Tune as our final event with him in residence. For the second half, we gave the world premiere of Where We Lost Our Shadows, a poignant multimedia work responding to the global refugee crisis by composer Du Yun and video artist Khaled Jarrar. Pakistani singer Ali Sethi sings a collection of ragas in the new work. Here he is introducing the classical raga Megh to us a few days beforehand. The piece opens with a symbolic instrument constructed from an emergency blanket played by percussionist Shayna Dunkelman. Du Yun demonstrates this symbolic instrument. We’re still feeling very honoured and grateful to have given the world premiere of this compelling and topical work. Written for orchestra, video, vocals and percussion, Where We Lost Our Shadows interweaves orchestral soundscapes with ragas, text from Palestinian poet Ghassan Zaqtan and footage of Jarrar’s journey with a group of refugees from Syria to Europe. Huge thanks to all our supporters who made Songs from the Road possible: Paul Hamlyn Foundation (in memory of Sir Claus Moser), Cockayne – Grants for the Arts and The London Community Foundation, the Hargreaves & Ball Trust, Nicholas & Margo Snowman, Louis Watt & Alice Fishburn, and the Aurora Patrons and Friends. We’re back at the Queen Elizabeth Hall in June for Music of the Spheres. 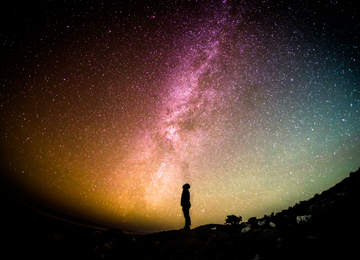 This next Orchestral Theatre concert soars to cosmic heights of wonder with choreography and visuals, featuring Mozart’s ‘Jupiter’ symphony performed from memory, violinist Pekka Kuusisto in Thomas Adès’ Violin Concerto and a new work by Max Richter.